We are Glad to inform you that Admission in four year B.E. course in Industrial are being offered by Institute of Industrial Electronics Engineering (IIEE) and all the interested individuals can apply for admission now. 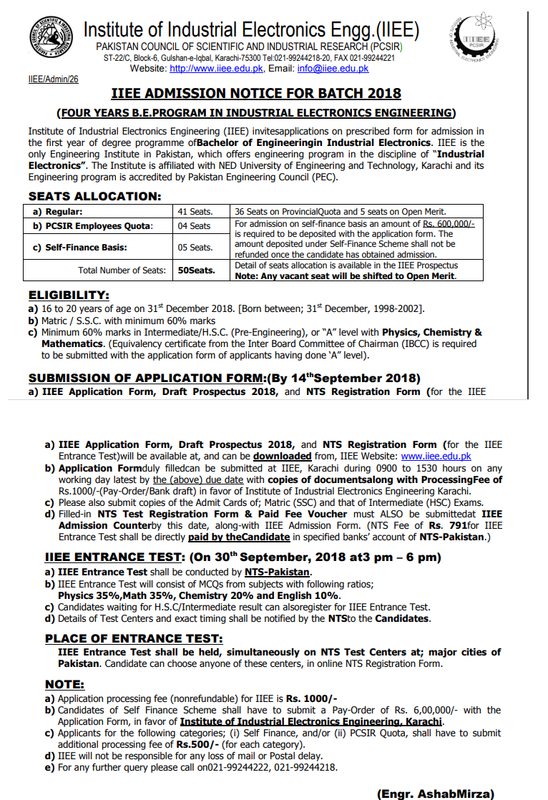 For this purpose, the application forms can be downloaded online through the official website of IIEE or National Testing Service (NTS) which must be submitted to IIEE Karachi admission department till 14 September, 2019. Apart from fulfilling basic requirements related to eligibility criteria, all the applicants will have to appear in a written test which will be held on 30th September, 2019 under the supervision of NTS. The responsibility of conducting the entrance exam has been allocated to National Testing Service in order to ensure fairness and transparency in the selection procedure as NTS has been conducting these kind of tests since 2002. The test will be based on NAT pattern, consisting of question related to 10% English, 30% Physics, 30% Math and 30% Chemistry. As passing the NTS test is quite tough, so we have provided a large number of free online tests below in this page which can be used as a guide for free, easy and quick preparation of the actual exam. So that you can pass the IIEE Institute Karachi NTS test with high marks in order brighten your chances for being granted the admission in the institutes. The Institute of Industrial Electronics Engineering (IIEE) began its operations in 1989 as a result of joint venture between Pakistani and Swiss governments. The key aim behind establishing IIEE was to improve the industrial sector facilities in the country.